View the entire table of contents for the March 31, 1996 issue. March 31, 1996 Rating Steak Houses Reviews of our Top 10 and then some, from New York to Los Angeles, San Antonio to Tampa, and points in between Lots of places serve great steaks. We want something more. 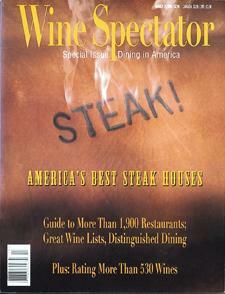 For the full article, check out the new issue of Wine Spectator, on newsstands March 31, 1996. What's Hot in The Food World: What today's diners want is the total experience: a warm welcome, an engaging menu and wine list, and atmosphere.